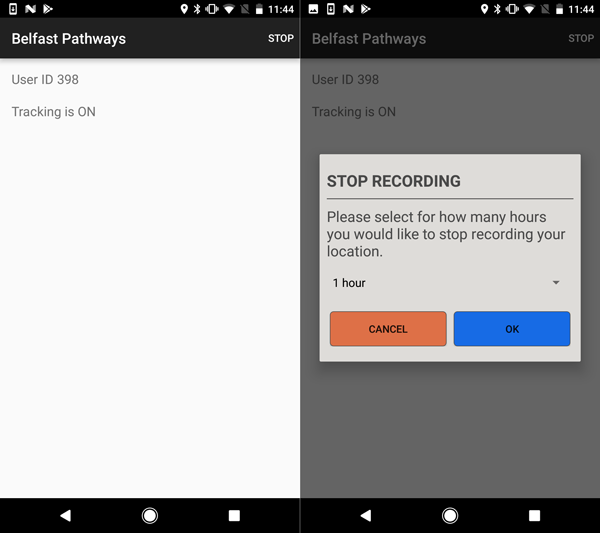 Belfast Pathways, our bespoke GPS Tracking Android App, is available Open Source at GitHub. The scripts and database structure that we used on the server are also available at GitHub, meaning that replication of our system should be quite easy. To use it, simply set up the database and scripts on the server, set the server base URL at Belfast-Tracker/app/src/main/res/values/strings.xml. From there, you should be able to install the app to android devices and start collecting data! more detailed setup instructions are provided in the repositories. This software can be used to track participants at any temporal resolution that the researcher requires, though based upon our testing we found that collecting a location every 4-seconds provides a good compromise between detail and device battery life. The app runs 'in the background' on the device, preventing accidental deactivation from the participant. If the app is closed, it will continue to collect data, and it will even resume data collection if the device is re-started. Should the participant not wish to be tracked, then they can use the 'Pause Tracking' functionality, whereby they can specify a period of time that they would like to tracking to pause for. After this time period has elapsed, tracking will resume. Data is logged to a local database, which is bulk-uploaded to the server when the device connects to a WiFi network with Internet connectivity. If the device remains connected to WiFi, then uploads will take place at regular intervals (we recommend two hours). Furthermore, the local data will only be deleted once the server has confirmed that it has been successfully uploaded. These measures minimise the potential for data loss, whilst also avoiding any cost from mobile data use on the part of the participant. An illustration of the data collected using this method can be seen in the maps section of this website. Walking interviews, which probed a number of sociospatial factors shaping people’s mobility patterns, were a key methodological component of the Belfast Mobility Project. Based on the premise that ‘emplacing’ (Riley 2010) interviews in local landscapes can serve as vital ‘prompts’ (Evans and Jones 2011, 856) that reveal critical spatial knowledge and meanings, the project employed a modified version of Kusenbach’s (2003) ‘go-along’ method, in which the researcher accompanies a participant during their ordinary activities and routines. In this instance, the interviews comprised a flexible and open-ended sequence of questions asked ‘en route’ as the researcher and interviewee walked around the local area retracing a ‘typical’ journey for the participant. These interviews were audio-recorded and later transcribed. A second researcher photographed aspects of the landscape that featured prominently in the interviewee’s narrative, allowing images to be GPS/GIS linked to interview excerpts. The route of the walk was also tracked using the Belfast Pathways smartphone application described in the previous section. Imagine you are a tour guide and we are visiting your community. We want to get an idea of how you use and experience the local environment on a typical day. We are particularly interested in how living in a divided part of the city affects your everyday life. Throughout the walk, we sought to explore how different kinds of sectarian (and, in our instance, paramilitary) threat shaped how participants moved through and used the local environment. The goal was to gather as much concrete information as possible about how particular environmental features affected residents’ lived experience of using and moving through their local area. Thus, the interviewers took the opportunity to point out potentially relevant features that were present throughout the journey and explore how residents themselves felt about encountering these aspects en route. At the same time, they remained sensitive to more hidden or subtle landscape features that may have a meaning only for ‘insiders’ to the area. We present below a sample interview schedule. The order and precise content of the questions varied across interviews, in response to the accounts provided by our participants during their actual walk. However, this schedule captures the core questions and themes that we addressed. What does it feel like walking through this area? What features of the area make it feel safe? Unsafe? What landmarks do you identify with? What features of the environment make you feel uncomfortable? Are there changes that could be made to the local environment that would allow people to use the area more freely? Tell us about the communities which live in close proximity to this area. Are there occasions when you have entered areas associated with the other community; if so, tell us about the circumstances? How could you tell you were in an area associated with that community? Did you feel safe? When walking around the local area, as we are now doing, do you generally worry about encountering or interacting with members of the other community? What about your own community? Are there times when you have altered your routes in order to avoid passing through or close to areas associated with the other community? If yes, tell or show us where this occurred. Do you ever change routes to avoid interacting with members of your own community? Are there any areas in your own community you wouldn’t enter? If so, why? Can you indicate any parts of the area that you would regard as equally ‘shared’ by both communities? Do you generally feel safe there? Do you use these kinds of mixed, shared spaces a lot? Are there local facilities that you would like to access more easily but are worried because they are located in or close to areas associated with the other community? Or are hard to physically access? Can you tell or show us where? How do you get to the city centre? How often do you go? Is it a safe and comfortable journey? If you had to give the government advice about how to make the local environment into a more open, inclusive space that could be shared by both communities, what would that advice be? The survey was designed to explore the relationship between social psychological factors such as intergroup contact experiences, strength of group identity and perceived intergroup threat and self-reported attitudes towards activity space segregation, including relevant policy attitudes (notably, attitudes towards government proposals to remove interface barriers between catholic and protestant communities). The full questionnaire used in our survey is available here and some notes on the nature of our main variables and details on how they were coded is available here. Dixon, J., Tredoux, C., Davies, G., Huck, J., Hocking, B., Sturgeon, B., Whyatt, D., Jarman, N. & Bryan, D. (forthcoming). Parallel lives: Intergroup contact, threat and the segregation of everyday activity spaces. Journal of Personality and Social Psychology. Davies, G. J. Dixon, C. Tredoux, J.D. Whyatt, J. Huck, B. Sturgeon, B. Hocking, N. Jarman and D. Bryan. 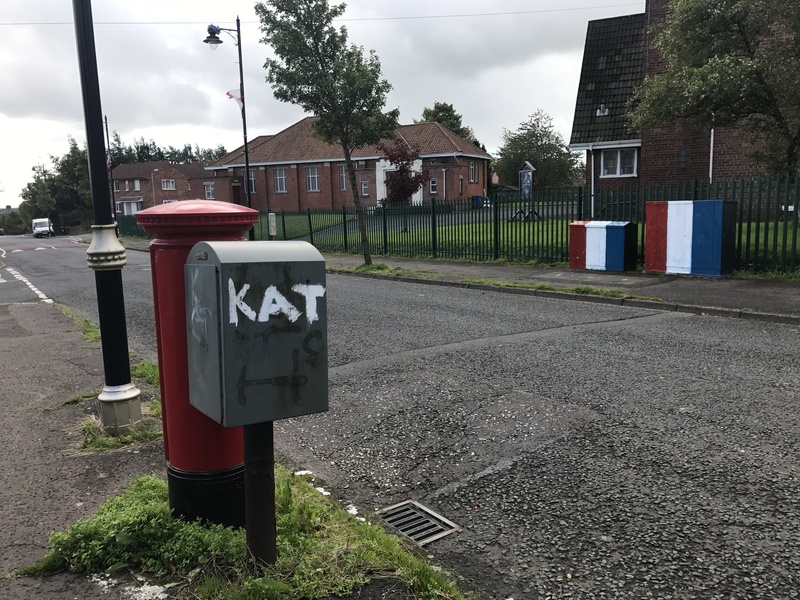 (forthcoming) Networks of Dis(connection): Mobility practices, tertiary streets and sectarian divisions in north Belfast. Annals of the American Association of Geographers. Huck, J.J., Whyatt, J.D. Sturgeon, B., Hocking, B., Davies, G., Dixon, J., Jarman, N. and Bryan, D. (2019). Exploring Segregation and Sharing in a Divided City: a PGIS approach. Annals of the Association of American Geographers, 109:1, 223-241. Hocking, B., Sturgeon, B., Huck, J.J., Whyatt, J.D. Davies, G., Dixon, J., Jarman, N. and Bryan, D. (2019). Negotiating the Ground: ‘Mobilizing’ a Divided Field Site in the Post-Conflict City. Mobilities, 13:6, 876-893. Hocking, B., Sturgeon, B., Dixon, J., Jarman, N., Bryan, D., Huck, J., Whyatt, D., & Davies, G. (2019). Place-identity and urban policy: Sharing leisure spaces in the ‘post-conflict’ city. In R. Piazza (Ed. ), Discourses of identity in liminal places and spaces (pp.166-192). London: Routledge. Huck, J.J., Whyatt, D., Davies, G., Hocking, B., Jarman, N., Sturgeon, B., Bryan, D. & Dixon, J. (2018). A Bayesian Approach to ‘Community Belonging’ and Segregation in a Divided City. In: Proceedings of the GIS Research UK 28th Annual Conference, Leicester, UK. 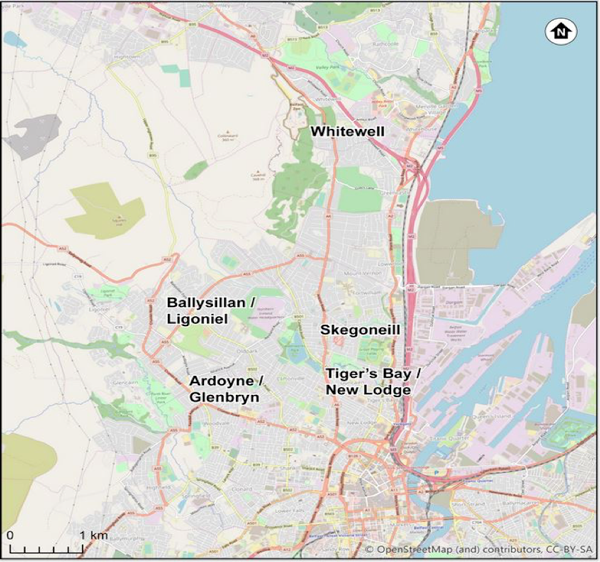 Davies, G., Whyatt, J.D., Huck, J.J., Dixon, J., Hocking, B., Jarman, N., Sturgeon, B., & Bryan, D. (2018) Combining T-communities and GPS tracking to assess the impact of segregation on mobility in Belfast. In: Proceedings of the GIS Research UK 28th Annual Conference, Leicester, UK. Whyatt, D., Huck, J.J. & Davies, G. (2017). Belfast Mobility Project: Integrating PGIS and GPS to Understand Patterns of Segregation. In: Proceedings of the GIS Research UK 25th Annual Conference, Manchester, UK. Davies, G., Huck, J.J., Whyatt, D., Hocking, B., Jarman, N., Sturgeon, B., Bryan, D. & Dixon, J. (2017). Belfast Mobility: Extracting Route Information from GPS Tracks. In: Proceedings of the GIS Research UK 25th Annual Conference, Manchester, UK. Whyatt, J.D., Davies, G., Huck, J.J., Dixon, J., Hocking, B., Jarman, N., Sturgeon, B., & Bryan, D. (2016) Belfast Pathways: Space-Time Analysis of Every Day Activities in a Segregated Environment. In: Proceedings of the GIS Research UK 24th Annual Conference, Greenwich, UK. The code for this website is available at GitHub.